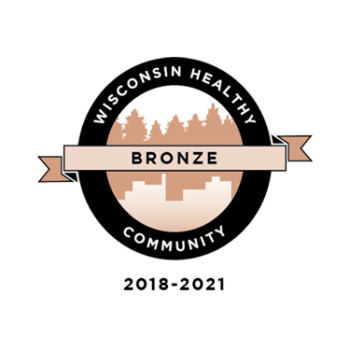 Portage has been recognized for its work to improve local health by receiving a Wisconsin Healthy Communities Designation. This new program is intended to recognize and encourage achievements in health improvement in Wisconsin communities, and to promote cooperation across multiple sectors. The Healthy Communities Designation program is designed to be accessible to communities of all shapes and sizes, both rural and urban. The definition of community is broad and can include counties, municipalities, neighborhoods and other self-defined, place-based communities in Wisconsin. The program uses a three-tiered approach – gold, silver and bronze – which are meant to provide a trajectory and serve as a guide for communities as they continue to strive toward better health. The Wisconsin Healthy Communities Designation is a new initiative offered by the Mobilizing Action Toward Community Health (MATCH) group of the UW Population Health Institute (UWPHI), in collaboration with diverse statewide groups. The program, funded by the Wisconsin Partnership Program, is designed to celebrate and encourage achievements in health improvement in Wisconsin, and to serve as a guide for communities to expand and enhance their health improvement efforts. The designation program recognizes communities that focus efforts across the multiple factors that influence health – including health behaviors, clinical care, social and economic factors, and the physical environment – with a focus on equity, multisector partnerships and sustainable solutions. The 31 communities received either a bronze, silver or gold designation. Four communities received a gold designation. The tiers are meant to provide a trajectory and serve as a guide for communities as they work toward comprehensive solutions for better health – the gold level representing the most difficult to achieve. However, receiving a designation, at any level, does not indicate that health or health equity has been achieved in a community; rather, the designation is meant to commend the efforts and the partnerships working to improve health. The initiative’s definition of community is broad and can include counties, municipalities, neighborhoods and other self-defined, place-based communities in Wisconsin. “This initiative was developed in response to a request from rural communities across the state and gives communities of all shapes and sizes – rural and urban – an opportunity to be recognized for the great work that they are doing to improve their own health,” said Tim Size, executive director of the Rural Wisconsin Health Cooperative, a collaborative of 42 rural hospitals and local health systems, and a member of the UW Population Health Institute’s advisory board. The Healthy Community Designation lasts for three years, at which point a community may reapply. Learn more about the program and the application process.